Create a backyard ecosystem brimming with fresh vegetables and fruit! Eat local, starting in your backyard! 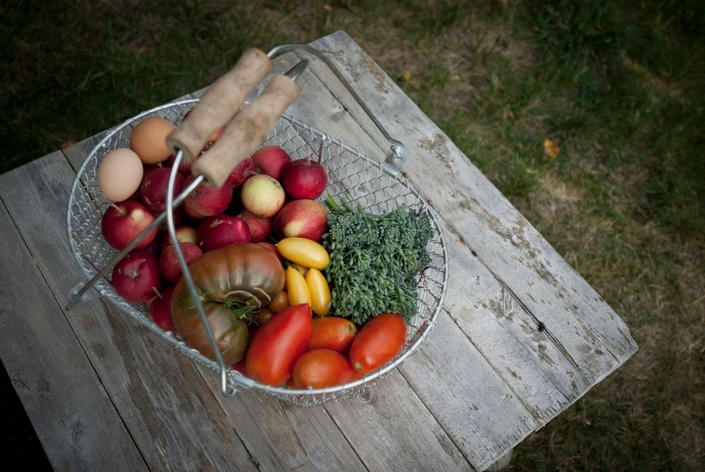 Living in a cold climate doesn't mean you can't enjoy homegrown delicious vegetables and fruit. This three-part class will teach you everything you need to know in order to convert your yard into an edible landscape. Learn ways to design a beautiful and bountiful space! Don't miss this opportunity to set yourself up for success this growing season! Kareen has been gardening in cold climates for more than a decade. She lives with her family on a 3/4 acre homestead in Bozeman, Montana with large annual gardens, a small greenhouse, an orchard of fruit trees and berry bushes, and beehives, along with chickens and ducks. Through her business, Broken Ground, she teaches local residents how to grow their own food while creating community around gardening. She is also an experienced permaculture practitioner, having studied with renowned designer Geoff Lawton, at the Permaculture Research Institute of Australia. She has specific training in earthworks, composting methods, soil biology, and urban permaculture design. Kareen has earned Master Gardener and Master Composter Certifications, is trained in Ecology Action's Grow Biointensive methods, and contributed to the Food Forest Design Charrette for Helena's 6th Ward Garden Park, with author, teacher and designer, Dave Jacke. She has also worked as a consultant for the sustainability organization, GoodtoChina, in Shanghai, China, and has worked on numerous organic farms in Australia, New Zealand, Western Massachusetts and Montana. Kareen is a regular contributor to Rocky Mountain Gardening Magazine and was featured in The New Pioneer. Don't miss out on the chance to create a beautiful backyard ecosystem that will feed you in vegetables, fruit and beauty throughout the growing season! Three modules and fourteen training videos packed full of information about how to design your property, improve your soil, and plant an edible ecosystem! Also included in this package is a one-on-one hour-long consultation with the instructor, Kareen Erbe. This consultation can be done via skype or phone (if you are not within a 20 mile radius of Bozeman). Get customized advice about your garden and property after taking the series! The Edible Backyards Series is designed to be a completely self-paced online course - you decide when you start and when you finish. Once enrolled, you will have access to the series for a full year from the date of purchase.